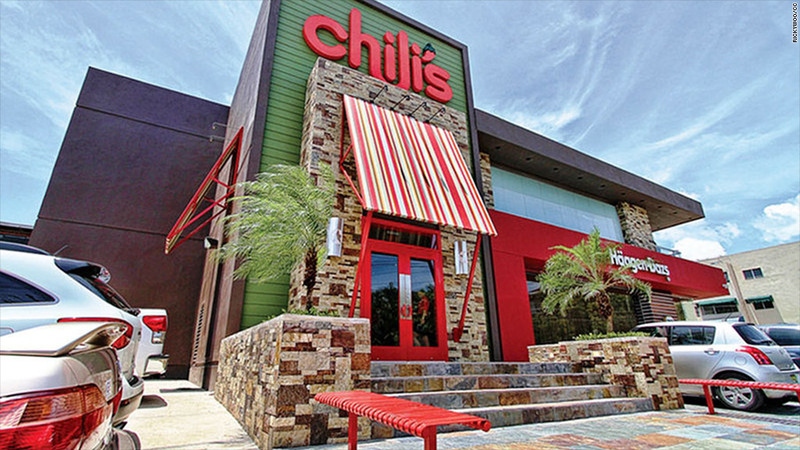 Chili's told guests Friday to "refrain from openly carrying firearms into our restaurants." Chili's, which is owned by Brinker International (EAT), said Friday, "We kindly ask that guests refrain from openly carrying firearms into our restaurants and we will continue to follow state and local laws on this issue." Sonic (SONC) said, "We're asking that customers refrain from bringing guns onto our patios or into our indoor dining areas." In recent months, gun enthusiasts have held rallies and openly carried firearms, including large automatic weapons, into restaurants. It's alarmed customers and led to campaigns against guns in restaurants from advocacy groups like "Moms Demand Action for Gun Sense in America." Earlier this month, Chipotle (CMG)said it did not want customers to bring guns into its restaurants "unless they are authorized law enforcement personnel." Last year, Starbucks (SBUX) also told customers they shouldn't bring guns into its stores. The company said the debate about whether people should openly carry guns had become increasingly uncivil and that the chain did not want its stores to be used as a political stage.